I have recently come to realize that some of the most basic of my thinking is not as evident and obvious to people around me as they are for me. This was a real wakeup call for me and made me think long and hard on what is important to me and how I do work. And consequently try to lead others with this as guiding star. My ideas is not new nor radical. The ideas I did meet is not bad, they just strive to achieve other goals (I think) or maybe the same goals but in a totally different manner. I have really tried my best not to portrait my ideas as better, but rather just another way. 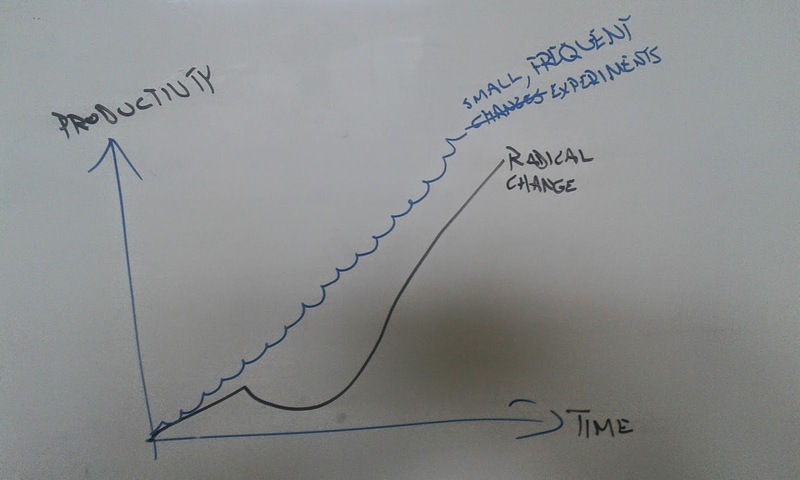 My agile and lean friends will quickly see that this is by not measure unique or new thinking. But I've come to realize that for people that haven't seen this kind of reasoning before it is very backwards and counterintuitive. This will not be complete in the sense that I will give the theoretical back... (YAAAAWN)...ground to why I think this way. Come and ask me. That means that you can put "to me" in front of every paragraph below. And you can disagree. Please tell me in that case so that I can improve. I think we are here to produce value for someone. Let's, just for fun, call this person "the customer". It's a name as good as any, right? In all honesty, if we think a little bit wider that customer could be ourselves as well, or anyone around us. Come to think about it the definition of value is a bit tricky to. It sure does not only mean money, if you think so when you read the rest. Money is easier to talk about since it so concrete, but it can be any value. I just came back from hospital with one of my sons. My son was the customer for the nurses and him getting treatment and ultimately free from his disease was the value. I strive to find a customer for everything I do, and I try to supply that customer with value. I think it's useful to try to reflect on what value we produce for our customers and how we can improve on that. Is this making my customer happier? How is this producing value for the customer? If the customer was in the room now, what would he suggest that we do? Do I need to help the customer understand how our suggestion could be even better for her? Does it make the car go faster? What is your question or guiding star? Why are you here? Why are you working here together? Can you formulate that in an F1-question. Furthermore I believe that we should delivering things as fast as possible. And in small batches. Both these things has to do with learning stuff; for everything we complete we will learn something. The more we learn the better we will become in producing better, more, faster to our customers. Also, delivering small things often rather than big things seldom tends to be favorable by most customers I've met. You build trust with your customers by showing that you can keep your word and deliver things to them. Finally, not to be underestimated in a world a lot of big projects, delivering something means that you are moving. Compare that to a big project where you hear nothing for several months. I'm obsessed really into with completing stuff. Keeping the lead time (from customer orders until it's completed) as short as possible. From the moment I start a task I try to find ways to finish it. As fast as possible. But, since I have the customer in mind, I also keep the quality in mind. Because just going faster is not going to help much, since that means that the quality goes down. Bad quality work will come back to us. Thanks to my friends I'm pushed towards better in smaller steps. Daniel commented below about this Simulation lacking real world connection and hence being silly. True - the game is not aimed to mimic any real world process (although... at some place I've worked... Not far away). I often call this "a simulation aimed to illustrate a single principle, namely that Lower WIP -> faster flow. That's all it does. But from this I've often found a lot of eyes open, and AHA! experiences had. And if you can see the principle manifested in your, much more complex context, then it can teach us something. Taking this reasoning further means that the way we work, the HOW, is just best so far. I'm willing to challenge everything we do and the structures we have now. All in the name of producing value for our customer. Another, more classical way to say this is; effectiveness is the doing the right thing. Efficiency is do thing the thing right. Thanks Henrik for this reminder! Efficiency is totally uninteresting to try to optimize if we're not effective. Who cares that we do stuff efficient if we're doing the wrong things, hence not reaching our goal (not effective)? A lot of organisations where I have consulted is quite the opposite. In fact, in many of organisations, most of the employees doesn't even know the goal. Or at least not what it means for them. I've met teams that simply didn't know who the customer was, for the things they did. The just did them. Efficient. It's very sad, I think. When you think about it, if you don't know the goal, you cannot really say if you're doing a good job. Or if you're improving. This means that we should change the way we work. Yes, I said it. We should change. The way. We work. And I think we should do it often. Even when we think that the way we are working is good. Because it can always be better, smoother and faster. The goal is to produce value for our customer as fast as possible, and as I said we should challenge everything we do today, that hinders us from going faster. "But we need to supervise and control in this way!" - No, you don't. You need control, but that can be achieved in other ways. By implementing great transparency for example. "But my customer want estimates!" - Yes, but that's just because you haven't showed him the alternative. I've never seen an end-customer call a company up and said thank you for the awesome estimating in the latests project. But I have seen end-customer thank people for the new feature in the product. "But this is how our organisational chart looks. It's all decided" - Do you think there's something we can change in it that would make the process go faster? That would produce value for our customer faster? How do we need to change the organisation to reach that goal? "We need to make sure that we think this over properly before we act" - Yes of course... but will our customer be happier by that? Or can we find another way to make our decision less scary, smaller maybe, so that we don't need to think about it as long, or as hard. By now, many of you have face palmed yourself a couple of times and probably called me names too. But this is just showing my reasoning (although I've had all of the above mentioned discussions at least once). The output of the system is what's important. Nothing is set. We are never done improving. But if we want to improve we must know what better means. What is the goal? "Does it make the car go faster?". "You will know them by their fruits. Grapes are not gathered from thorn bushes nor figs from thistles, are they? It raises an interesting philosophical question that we might save for another time to answer; if the organisation is in an awful state but produce wonderful things to their customers... Is that bad or good? What can one do then? That's where the fun begins - you can do whatever you see fit to change your system to produce better values for your customer faster. With a guiding star you can always evaluate your actions towards that goal. Did we get closer or further away? Here's two things that occupies my thinking a lot right now. I think that we should change often but small. So small that we easily can go back if it didn't work out. For fun let's call those changes "experiment", shall we. That's a nice psychological trick because in an experiment there's no fail or succeed. There's just a result. Our hypothesis was validated or not. Either way we learned and can take the next little step. I love this way of making improvements or changes. Also this approach is know as the Scientific method and is the way all science has been discovered since about 4th century BCE through Aristotle, so its well established. Tried and tested. Also, all changes will take effort from your normal work, creating a dip in productivity. Do you want that dip to be long and deep or short and shallow? That's something that you can choose. I like the latter. The former (long, deep dip in productivity) comes from radical big changes. Who knows best what and where to make the small changes I just talked about? The direction level of the company or each person close to the tool and production? The answer is obvious - the person close to the information about the things we're making knows the most. Move the authority to the information. That means, trust our employees on all levels to make the improvements they see fit. This is really scary, because that means that we loose the perceived control on the top management level. The gain, however is immense; everyone is involved in improvement, every persons creativity, inspiration and intelligence. The loss of control can be managed by using a transparent culture where all information is known to everyone. I'm all for the second approach, since it's much faster and produced more value faster for our customer (see the top of this article). Ehhh... there's people in there you know? But wait here now just for a minute... so the goal for us is just to slave away, producing money as fast as possible for someone else, forgetting my own needs. I need to be happy to be able to do a good job. Thank you Tobbe and Emil for this input and pointing out the holes in my reasoning. And let me be the first to say that of course you are right; we need to start with the people in the process. This is one of the pillars of the Toyota production system (where I get a lot of inspiration); Respect for people. The other one being continuous improvements. To me, and I might very well be wrong, this is the strategy. They HOW to we plan to achieve our vision and goal. And I wholeheartedly buy into the reasoning found today in lean and agile in the software movement (and other places). If you don't give the teams and people autonomy, help them develop their mastery and ultimately show them that they are important, they have a purpose reaching a continuously improving process / organization will be very hard. If not impossible. I think. From my experience leading from the top with a strong focus on WHY we are here (the things I've talked about in the post) and then extending the autonomy to the individual teams and employees to change their environment and processes to more effectively reach that goal is much more ... effective. I've seen that succeed. A number of times. And I've seen it fail too. Because it's hard, since it means letting go of power and (perceived) control, something that most people are more reluctant to let go than money, in my experience. Again - thanks Emil and Tobbe for making me think harder and add this section. I feel you made this post more complete. We are here to bring value to some customer. Us just working without producing value for someone is truly useless. Hence I think we should change the way we work to become better and better in producing value for our customer faster, with better quality and more frequently. Our processes, organization, rules etc. just just "best so far". I'm not saying that I'm right and you are wrong. I'm just saying that this is the way that I reason, so that you can understand me if we end up in a discussion. I want us to change to improve. I think improving is improvements for our customer.